Partial anomalous pulmonary venous connection (PAPVC) is a rare congenital cardiac defect. As the name suggests, in PAPVC, the blood flow from a few of the pulmonary veins return to the right atrium instead of the left atrium. Usually, a single pulmonary vein is anomalous. Rarely, all the veins from one lung are anomalous. Thus, some of the pulmonary venous flow enters the systemic venous circulation. Embryologically, PAPVC is similar to total anomalous pulmonary venous connection (TAPVC); however, TAPVC differs in that all or most pulmonary venous vessels connect to the right side of the heart in TAPVC (see the image below). Knowledge of the variation patterns of normal pulmonary venous drainage is necessary in order to diagnose PAPVC. Anomalous pulmonary venous return (APVR). Types of total anomalous pulmonary venous connection. PAPVC from the right lung is twice as common as PAPVC from the left lung. The most common form of PAPVC is one in which a right upper pulmonary vein connects to the right atrium or the superior vena cava. This form is almost always associated with a sinus venosus type of atrial septal defect (ASD). The right pulmonary veins can also drain into the inferior vena cava. The left pulmonary veins can drain into the innominate vein, the coronary sinus, and, rarely, the cavae, right atrium, or left subclavian vein. Anatomically, PAPVC can involve a wide variety of connections, and can be subdivided into several categories. This is the most common type of PAPVC. The ASD is usually the sinus venosus type. Approximately 10% have a secundum ASD associated with this anomaly. The anomalous pulmonary vein, usually the right upper or middle pulmonary vein can either override the intra atrial septum (anomalous drainage) or can drain separately into the superior vena cava (true anomalous connection). Usually, the connection is unobstructed. This is a very rare finding and mostly involves the anomalous drainage of the right upper pulmonary vein into the superior vena cava. Only 3% of patients had PAPVC from the left lung to the innominate vein. This is usually seen with heterotaxia syndromes (polysplenia). Left atrial isomerism with a common atrium is observed. Because of the abnormal positioning of the intra-atrial septum, the right-sided pulmonary veins anastomose to the anatomically right-sided atrium, which is the atrium that also receives the inferior vena cava. About half of the cases may involve some degree of obstruction, either due to narrowing of a discrete area or due to diffuse hypoplasia of that vein. This condition is associated with presence of ipsilateral pulmonary arterial hypoplasia. This syndrome is also known as Halasz syndrome, mirror-image lung syndrome, hypogenetic lung syndrome, epibronchial right pulmonary artery syndrome, vena cava bronchovascular syndrome, or congenital pulmonary venolobar syndrome. It is more common in females and can be familial. Usually, the anomaly involves the right lung; the left lung is very rarely involved. In this syndrome, a venous anomaly, an arterial anomaly, and pulmonary anomaly are all observed. The pulmonary abnormality includes a sequestered lobe of the lung that is separated from the bronchial tree and has nonfunctioning lung tissue. It is associated with hypoplastic or aplastic right pulmonary artery segments, hypoplastic or absent bronchi, hypoplasia of the right lung, horseshoe lung, and eventration of the hemidiaphragm. The venous anomaly is PAPVC, usually with the right pulmonary veins draining into the inferior vena cava. The arterial anomaly is a collateral arterial vessel (aberrant vessel) with blood supply of the right lower lobe from the abdominal aorta. Dextropositioning of the heart due to right lung hypoplasia may be observed. Usually, the atrial septum is intact. About 25% cases have other associated congenital heart defects. Numerous factors determine the ratio of pulmonary blood flow (Qp) to systemic flow (Qs). The shunt magnitude, expressed as the Qp:Qs ratio, and other factors determine development of symptoms and complications. The most important factor is the number of pulmonary veins that drain into the systemic circulation. The more veins that anomalously drain, the more blood returns to the right side of the heart. Some authors have suggested that this defect becomes clinically significant when 50% or more of the pulmonary veins anomalously return. In addition, the source of the returning blood plays a role in determining the clinical effect of the defect. In an individual who is upright, blood flow to the lungs is primarily directed to the lower and middle lobes. Therefore, more blood returns to the systemic venous circulation in individuals in whom the anomalous connection drains into either the right middle and lower lobes or the left lower lobe of the lung. An associated cardiac defect, such as an ASD, may add to the left-to-right shunting. In scimitar syndrome, the flow from the PAPVC causes a left-to-right shunt. Again, the number of anomalous veins involved determines the symptoms and signs. The aberrant artery may cause additional left-to-right shunt. Over many years, excessive pulmonary venous return to the right side of the heart causes right atrial and ventricular dilation. This has numerous consequences, including risk of arrhythmia development, right-sided heart failure, and development of pulmonary hypertension. A native PAPVC usually does not have any associated obstruction to venous drainage. However, obstruction may occur postoperatively due to baffle obstruction. Most data regarding prevalence of this condition have been garnered from autopsy series that estimate an incidence of 0.4-0.7%. However, autopsy series may overestimate the clinical significance of this condition because many of these cases were asymptomatic; thus, the true incidence of patients who present antemortem with this condition is lower. Clinical diagnosis of isolated PAPVC is quite rare. PAPVC occurs in approximately 10% of patients with a proven ASD. Few data are available regarding mortality due to this lesion because mortality credited to the defect occurs only in adults and the diagnosis has historically been made at autopsy. Major morbidity, including arrhythmias, right-sided cardiac failure, and, rarely, pulmonary vascular disease, also primarily occurs in adults. No data regarding racial predilection are available. The incidence is higher in the female population. PAPVC is a congenital defect. Clinical evidence of this congenital defect may not be apparent until the patient reaches middle age. Lilje C, Weiss F, Weil J. Detection of partial anomalous pulmonary venous connection by magnetic resonance imaging. Pediatr Cardiol. 2005 Jul-Aug. 26(4):490-1. [Medline]. Julsrud PR, Ehman RL. The "broken ring" sign in magnetic resonance imaging of partial anomalous pulmonary venous connection to the superior vena cava. Mayo Clin Proc. 1985 Dec. 60(12):874-9. [Medline]. Kasahara H, Aeba R, Tanami Y, Yozu R. Multislice computed tomography is useful for evaluating partial anomalous pulmonary venous connection. J Cardiothorac Surg. 2010 May 18. 5(1):40. [Medline]. Paulista MD, Paulista PH, Guerra AL, Paulista PP. Surgical treatment of partial anomalous pulmonary venous connection to the superior vena cava. Rev Bras Cir Cardiovasc. 2009 Jun. 24(2):133-7. [Medline]. Pace Napoleone C, Mariucci E, Angeli E, et al. Sinus node dysfunction after partial anomalous pulmonary venous connection repair. J Thorac Cardiovasc Surg. 2014 May. 147(5):1594-8. [Medline]. Gustafson RA, Warden HE, Murray GF, et al. Partial anomalous pulmonary venous connection to the right side of the heart. J Thorac Cardiovasc Surg. 1989 Nov. 98(5 Pt 2):861-8. [Medline]. Xue JR, Luo Y, Cheng P, Cao RW. [Diagnosis and treatment of partial anomalous pulmonary venous connection]. Zhonghua Yi Xue Za Zhi. 2008 Apr 15. 88(15):1066-8. [Medline]. Coulson JD, Bullaboy CA. Concentric placement of stents to relieve an obstructed anomalous pulmonary venous connection. Cathet Cardiovasc Diagn. 1997 Oct. 42(2):201-4. [Medline]. Danilowicz D, Kronzon I. Use of contrast echocardiography in the diagnosis of partial anomalous pulmonary venous connection. Am J Cardiol. 1979 Feb. 43(2):248-52. [Medline]. Elami A, Rein AJ, Preminger TJ, et al. Tetralogy of Fallot, absent pulmonary valve, partial anomalous pulmonary venous return and coarctation of the aorta. Int J Cardiol. 1995 Dec. 52(3):203-6. [Medline]. Forbess LW, O'Laughlin MP, Harrison JK. Partially anomalous pulmonary venous connection: demonstration of dual drainage allowing nonsurgical correction. Cathet Cardiovasc Diagn. 1998 Jul. 44(3):330-5. [Medline]. Hazirolan T, Ozkan E, Haliloglu M, et al. Complex venous anomalies: magnetic resonance imaging findings in a 5-year-old boy. Surg Radiol Anat. 2006 Oct. 28(5):534-8. [Medline]. Jemielity M, Perek B, Paluszkiewicz L, et al. 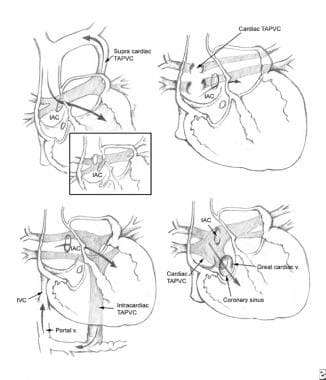 Results of repair of partial anomalous pulmonary venous connection and sinus venosus atrial septal defect in adults. J Heart Valve Dis. 1998 Jul. 7(4):410-4. [Medline]. Nakahira A, Yagihara T, Kagisaki K, et al. Partial anomalous pulmonary venous connection to the superior vena cava. Ann Thorac Surg. 2006 Sep. 82(3):978-82. [Medline]. Powell AJ, Chung T, Landzberg MJ, Geva T. Accuracy of MRI evaluation of pulmonary blood supply in patients with complex pulmonary stenosis or atresia. Int J Card Imaging. 2000 Jun. 16(3):169-74. [Medline]. Respondek-Liberska M, Janiak K, Moll J, et al. Prenatal diagnosis of partial anomalous pulmonary venous connection by detection of dilatation of superior vena cava in hypoplastic left heart. A case report. Fetal Diagn Ther. 2002 Sep-Oct. 17(5):298-301. [Medline]. Ritter S, Tani LY, Shaddy RE, et al. An unusual variant of total anomalous pulmonary venous connection with varices and multiple drainage sites. Pediatr Cardiol. 2000 May-Jun. 21(3):289-91. [Medline]. Valsangiacomo ER, Hornberger LK, Barrea C, et al. Partial and total anomalous pulmonary venous connection in the fetus: two-dimensional and Doppler echocardiographic findings. Ultrasound Obstet Gynecol. 2003 Sep. 22(3):257-63. [Medline]. Vanderheyden M, Goethals M, Van Hoe L. Partial anomalous pulmonary venous connection or scimitar syndrome. Heart. 2003 Jul. 89(7):761. [Medline]. [Full Text]. Partial anomalous pulmonary venous return of the left lower pulmonary vein seen entering the innominate vein as demonstrated via echocardiogram (A) and angiogram (B).